Mäurer & Wirtz have launched Tabac Man Fire Power. Tabac Man Fire Power is a flanker to 2000's Tabac Man (not to be confused with Tabac Original). Energetic. Striking. Explosive. That is Tabac Man Fire Power. A fragrance that represents concentrated masculinity and power. Created for all adventurers who want to push themselves to the limit and never feel intimidated. The launch pays homage to the popular fragrance Tabac Man which, with its simple, black packaging, is dedicated to all strong, confident, earthy men. With Tabac Man Fire Power, this classic achieves a new dimension – inspired by the untamed primal force of fresh, glowing lava. [...] A fragrance that is lively and warm, compellingly masculine. Spicy accents kindle the freshness of bergamot with dynamic potency. Its heart scores with hints of tobacco and aromatic lavender. The strikingly masculine base note gets its long-lasting expressiveness from patchouli. 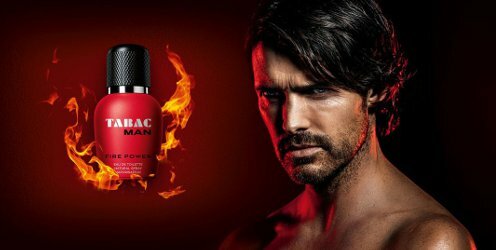 The individual components of the fragrance are an indication of the masculine strength inherent in Tabac Man Fire Power. Benzoin, also known as "frankincense from Java", comes from the resin of the benzoin tree, which grows wild in mountainous regions above 1,000 metres. Benzoin has been used in fragrances for centuries and now gives Tabac Man Fire Power its distinctive warmth. Mäurer & Wirtz Tabac Man Fire Power is available in 30 and 50 ml Eau de Toilette and in matching grooming products. Wow… this release has to win for corniest marketing. The model looks like a naked Marboro Man. The bottle looks like red nail polish. It’s great. So bad it’s good, I might have to order a sample. Be sure to watch the video (posted right after this). It’s so bad it’s fantastic. I just watched it and can’t help think of the original animated “Grinch who stole Christmas”… the narrator’s deep voice, the rhyming soundtrack… the guy wandering around the landscape with a scowl. It just needs Max the dog. Oh right! Would not have thought of it. Oh I can see it, that’s funny!